Yamaha HS7 Active Studio Monitor, White These multi-purpose active studio speakers are just as good for home listening as critical home stud.. 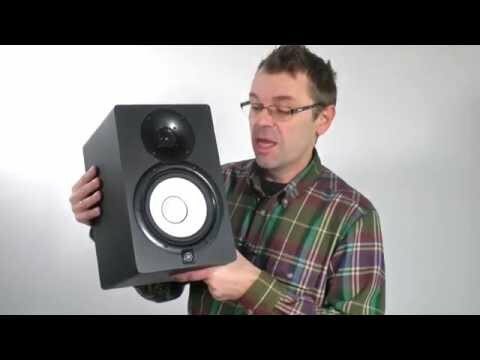 These multi-purpose active studio speakers are just as good for home listening as critical home studio monitoring - Their 6.5" woofer delivers slightly more power and bass than the baby brother, the HS5, whilst still offering a perfect solution for small-to-medium sized monitoring applications. XLR and 6.3mm Jack inputs offer versatile inputs from your soundcard or audio interface, whilst Room and High Frequency controls on the rear of the monitor allow you to tailor the response of your speakers depending on your room size and shape. A new, limited edition White finish also ensure they work well alongside other studio gear or home decor. The Yamaha HS7s feature a rear switch for Room control and High Trim response. Depending on the size and shape of your room, you can cut the low frequency response by -2dB or -4dB, further helping to eliminate unwanted 'boom' and resonance in smaller room setups. The High Trim allows you to Boost or Cut the high frequencies at 2kHz to compensate.